This assumes a multi-level residential water loss (Class 3 | Cat 1). Considerable amounts of DriHeat performance drying equipment were exclusively employed, subsequently necessitating the use of a DriHeat Power Distribution Box. There are several different manufacturers that make Power Distribution Boxes (AKA Spider Boxes). Generally, these power distribution boxes perform the same function and should invoice substantially the same. The ~15 other pieces of performance dry out equipment that necessitated the deployment of the power distribution box reside beyond the scope of this Insight Sheet. 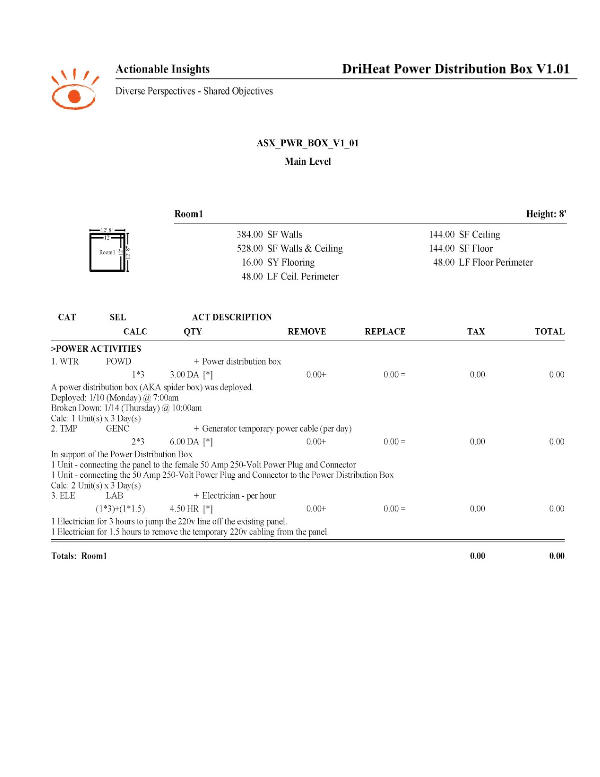 This Insight Sheet exists to clarify how one might invoice for a DriHeat Power Distribution Box (or a similar Power Distribution Box).